Home » Interesting Discussions » Do you hoard product boxes? 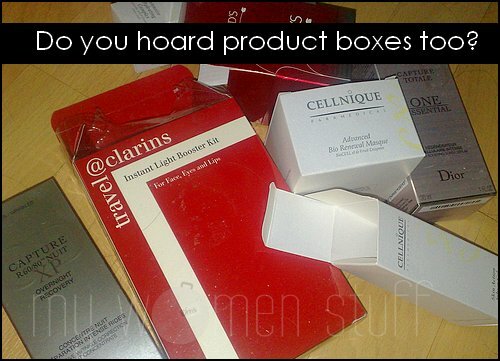 Do you hoard product boxes? When I was spring cleaning over the weekend, I found loads of product boxes – all empty. It made me wonder why I ever kept them in the first place. Was it due to some misplaced sense of order or pure laziness or just that packrat instinct that had me keeping product boxes or even products in their original boxes “just in case it comes in handy one day“. I also realized that many product boxes are too small to be reused for anything else. Pity really. I don’t mind buying products that do not come in boxes. Its all part of that environmental drive no? 🙂 But I’m aware that products do have to come packaged in boxes for ease of transport – prevents them from moving around too much and smashing up. Perhaps there can be a way to prevent that and still reduce the use of packaging? Update: I can’t reply to every single one but I had fun reading all your responses and to know I’m not alone in this 😀 Keep it coming! PREVIOUS POST: Beautilicious Cosmetics Magic Spell Auto Eyeliner puts me under a spell! I wish we don’t have to have boxes with the products, it’s such a waste of resources! LOL i have a habit of keeping those too! i just thought they might come in handy one day, but the fact is – they never did! I always keep them aside for the recycle bin but never end up going, the boxes keep on pilling, throwing them out makes me feel guilty. I do the same! I keep them, then after a couple of months I find them and toss them! It’s some sense of preciousness attached to them–especially these days when the packaging is all so sturdy and nice. At the end of the day I have no idea what to do with them. Actually I end up recycling the boxes–I’m not sure if it is the right material for recycling, but I throw it in the recycle bin anyway. And yes, there’s got to be a more eco-friendly way to pack these makeup items. It’s scary how much waste there is! i love to keep them in their packaging. =) until it becomes really disgusting i’ll chuck them out. until then, i still do esp for makeup. i hate them being scratched! Same here, i always think that a big part of the money i paid for the product went to the boxes too, so i guess that’s why I been keeping them..
Me too !! I also keep the boxes thinking that maybe 1 day I have some uses for them but I never seem to. In the end after months of hoarding them, I throw them all away (uh, a portion of them). I kept them too ! But at the end of the year, it end in the dustbin. Last week, just throw a total of 20 boxes! m throwing them out big time too. hi juan. that dior rouge serum box is so nice! the right size for a toddler’s grip, nice shiny dark blue colour. u notice that the inside, unlike other lipstick boxes, is a crimson rouge colour? nice touch.